Decay and rot. That’s what it’s all about. That’s the very essence of composting and there are many materials that decay and decompose and are beneficial to our gardens. It’s nature’s way of cleaning up and recycling the old to generate the new. We see evidence of it all around when we see old wood with fungus or when walking in the woods and see vegetation decaying. Nature has got pretty good at the process now and by composting we can speed up the process to benefit our horticultural activities. Composting is cheap and easy to set up and provides a convenient, efficient and productive way of dealing with household food scraps too. Each time we cut the grass or plants and leave the clippings around the process of natural composting begins. As organic materials decompose they begin to break down – but there are factors which can slow down or speed up the process. 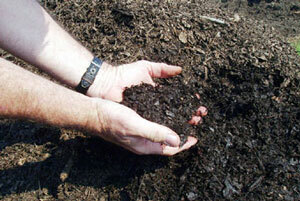 Basically, any organic material can be successfully added to a compost mix. Plant cuttings and leaves (providing they aren’t diseased), kitchen vegetable waste, yard trimmings and natural foods like windfall fruits. Left-over, unwanted food waste from the table can be added to the compost too. Instead of being tossed into the trash can it can be used to bring value the soil. Be wary though of meat that will likely cause a stink and could attract rodents. We don’t want that problem! Use foods like vegetables and fruit, bread products, coffee grounds, tea leaves – really good for composting – and noodles, rice and grains. When you clean-up after your pets in the yard or bring back the bags after walking Fido, add that to the compost too. That’s good nitrogen which helps with the composting process. Some manure from a local stable or goat farm would be a great addition. It’s all good organic stuff. You can mix it all – leaves, food waste, grass, leaves, manure, some paper and cardboard – bring it on! If you’re going to be setting up a compost pile in your yard the best way to manage it is the layering method. Just like layering a casserole. First a layer of leaves, grass clippings and other organic stuff. Then add the food waste. Next a layer of animal manure/feces. And then repeat. Keep the layers thin as you stack them. If the pile is too compacted the compost will be starved of oxygen and the bacteria will be unable to work. Four components are required for the composting to take place – the compost ingredients, the right amount of oxygen, water moisture and temperature. Opinions vary as to whether you should turn the pile or not. Some say that it helps to keep the pile ‘open’ and oxygenated and the contents ‘cycling’ over. Others don’t worry about turning . The size of the pile can make it impractical. What is important is that oxygen should be able to reach to the center of the pile. Don’t allow your pile to become a solid wadge. 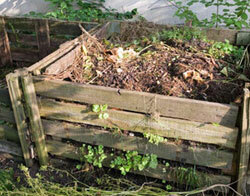 Using a compost container makes the composting process tidier which would be a benefit in a smaller garden. After all, it’s not likely that you’ll want to view your open compost pile from the dining room window! There is the classic box style of composter where you add material through the lid and access the finished compost through sliding hatches at the bottom. Another very popular style is the rotating composter. Very convenient to use it’s a case of adding ingredients through a door. Every few days the composter’s just given a couple of turns to keep the contents mixed and aerated. Many of the benefits are obvious. One right away is that food scraps are recycled rather than wasted. And another obvious one is that all the grass clippings, yard sweepings and food don’t end up clogging up landfill sites. Composting is an inexpensive, convenient way to provide nutrition for the garden and containers. It’s a totally natural and inexpensive way to fertilize the garden without being concerned that the soil contains nasty additions like pesticides. Chemical fertilizers can be harmful to tender roots. They can contain substances that can prove harmful to humans, insects and bird life too. Compost offers a completely natural balance of rich nutrition and energy to rejuvenate the soil and enhance its water absorption. And the treated soil looks and smells sweeter. 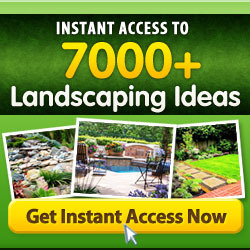 A huge benefit are the worms that will take up residence in your garden. While worms might not be your favorite wriggling thing their existence in your garden is very reassuring. It means that the soil is in good balance. As the worms move around the soil becomes oxygenated and provided with water courses. Compost also acts as a shield for your plants too as the health of the plants is bolstered. The phrase “An apple a day keeps the doctor away” can equally be applied to plants. Whichever composting alternative you chose will be dependent on preference or circumstances. Indoor or outdoor composter? Space constraints could well dictate that you have a kitchen composter and there are containers designed for kitchen use. These containers complete the process of composting without the use of oxygen. The benefit of the kitchen composter is that the process takes less time than outdoor composters. The drawback is that they can give off a possible odor unless you purchase one that specifically addresses that issue. Another downside is that you’ll be buying and changing odor-eliminating filters. With composting outdoors the size of the container and any odor is almost irrelevant. You can use larger containers and a larger compost pile. Aerobic and anaerobic are also two composting alternatives. Aerobic means that the composting needs oxygen to aid the breakdown process. Anaerobic is the absence of oxygen in the process. Either will produce a good compost. But anaerobic requires less effort because there’s no rotating involved. The flip side to that is that the compost does smell a lot worse and you have to keep an eye on the water content. The final compost is not as soft and earthy. Aerobic compost needs to be rotated to move the oxygen around . Depending on how much it’s rotated it can be ready in as little as fourteen days. There isn’t a putrid odor and the compost is much more earth-like. Worms or no worms? Many people who compost choose worms to help the composting process. This is known as vermicomposting. 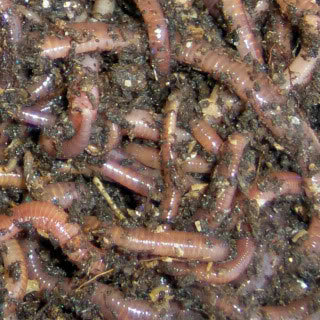 The use of worms helps the compost to break down faster and vermicomposting can be done either indoors or outdoors. The worms need a bedding in the container and this can be done with a mixture of leaves and compost soil. You’ll need a container with a lid that keeps light out and the container must be kept out of direct light. The container also needs to allow oxygen to circulate and an eye has to be kept on the moisture content as worms can’t live in dry conditions. Organic composting using natural ingredients makes for a better compost than using non-organic material such as ready-bagged compost. which contains dry material rather than living. That’s not nearly as good for the garden. It might be more time consuming to do organic composting but you can be sure that the results are far better. 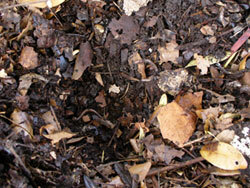 Yet another type of composting is called Bokashi. Bokashi is the Japanese word for fermeted compost and this is acheved without the use of oxygen. Production of the compost only takes fourteen days and relies heavily on fermenting of the food. This method uses a wider varety of foods so there is less food waste and you don’t have to rotate the compost. It is produced using a lidded container so it can be done both indoors and out. A drawback with this method is that you have to buy the Bokashi mix (compost starter) or make it yourself. Hot composting is yet another method which people use to produce compost faster. The compost pile is closely watched and is rotated as heat levels change. Instead of gradually adding material to the compost, the hot composting method requires all the ingredients to be ready to put in. The material needs to be in a ready-to-break-down state so has to be finely cut. As the temperature drops towards 130 degrees the pile needs to be rotated. It is also necessary to keep an eye on the moisture content. With all the choices you need to decide which method you’ll be using. Specific containers can be purchased for indoor use. There are kitchen ones with special filters and ones which are airtight depending on whether you opt for the oxygen or non-oxygen method. 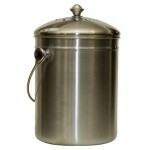 There are countertop containers made of stainless steel or attractive stoneware models. There are also stainless steel compost pails which have a charcoal filtering system to reduce odors and these can be washed out in a dishwasher. If you’re using worms to compost you can use a container with stacking trays that form sort of worm condos! Or a plastic composting container can modified to make it suitable for accommodating worms. When you’re ready to get composting you can order up worms and have them delivered right to your doorstep. There are composting containers that have one chamber and other versions with several chambers. Most people use the single chamber model. If you buy the manual compost bins you have to rotate them by hand. Whether that is practical for you depends on how often you have to do it and how heavy they are to move. Probably the easist bin to handle is the rotating or tumbling compost bin. These come in various sizes from those small enough to fit indoors on the kitchen counter up to ones large and sturdy enough to be used outdoors. At the extremes, composting can be quite a science but most of us are happy to recycle our organic greenery and food waste to produce nutritious compost for our flowers and vegetables.